hmmm...its been two days since this builder alert was sounded and I don\'t yet see anything from Vans Aircraft. Did I miss something that has been published? I didn\'t see anything on their web site. Just wondering. No response yet, but I feel certain they are working on it. The fact the caution is out there now is enough ( I hope ! ). I\'m sure they want to issue a response that everyone can do, and not have to visit the problem again. It is a real problem. Now we are finding out other LSA planes have had similar problems. As Larry said, we are saying what WE have done, but nothing official. I feel comfortable with mine now. It really shouldn\'t be that difficult to just strip back off the items on the top of the engine that interfere with the removal of the baffle. We all have detailed instructions and experience with that. The baffle itself may be a little tedious to get off, but I think that, with a little care, we might save most of the seal that we made. I really don\'t like the idea of cutting into that $200 part. 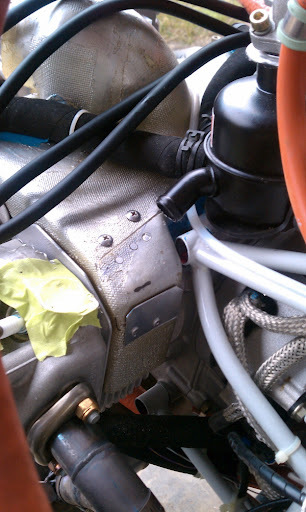 In fact, according to one of the Rotax engine instructors, he thought that the seal that we were making was overkill. Apparently, none of the other users of this engine go through that sealing process. They just trim for a close fit, and rely on the population of parts of top, to keep it in place. Actually, I kind of like the idea of being able to take that baffle off, without going through the clean and reseal process. But the best answer for us folks, still in the build process, is to wait for the Van\'s fix. That way, I\'m sure that we will get the best solution and I would expect that solution to be timely. \r\n	2013- RV12, Kit #119. N123M First flight Nov21. It\'s a keeper! \r\nPulled the cowls and as close as possible checked the torque on two of the bolts. 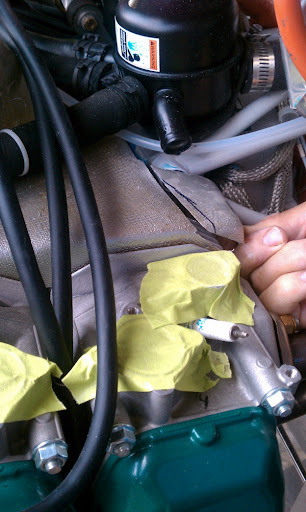 But after years of building race engines, I felt confident that I had properly torqued and \'red\' locktited all four. Anytime there are metal bolts threaded into case halves it is a good idea to locktite. Mine are good but I hope future builders learn this lesson. Not sure I would have used RED Loctite. For sure they won\'t come loose, but you generally have to HEAT \'red\' to remove them. Can do, but maybe over-kill here. Time will tell if \'Blue\' is enough, but I feel it is. Put plenty on, and fill the voids. Due to adding a lubricant during torquing, I would stay at the 26# figure. If anyone has a problem after adding SUFFICIENT \'blue\', for sure let all of us know. Page 46-06 in the instructions cover the bolt installation. Calls for simple split lock washers. The picture is very clear. The issue at this point is how to ensure they stay put. Several of us have had a problem. Some of us have Loctited, \'blue\', these bolts. Maybe by the time you are ready to install these, there will be a published solution. Just keep 46-06 in mind. This is a serious problem!!!!! \r\nFound upper left and lower left bolts finger tight. I removed all bolts and reinstalled with locktite blue. Cut a section of the cowl out to access the upper left. Reinstalled the cut out with nut plates and aluminum tabs for future inspections. I don\'t fully trust it yet. If anybody is interested, I will be glad to send photos via email. \nFound upper left and lower left bolts finger tight. I removed all bolts and reinstalled with locktite blue. Cut a section of the cowl out to access the upper left. Reinstalled the cut out with nut plates and aluminum tabs for future inspections. I don\'t fully trust it yet. If anybody is interested, I will be glad to send photos via email. You better believe this is a SERIOUS problem. This issue is more than 1 week OLD and the only notification to those that have flying RV-12s has been via this website. This is indeed a SAFETY of FLIGHT issue, as mentioned in the initial post, and notification to ALL RV-12 owners HAS NOT but should have been made by now. Many have found at least 1 capscrew loose. At least three or more have been flying with 2 of the 4 capscrews loose or missing. \nA periodic inspection is NOT an acceptable solution because the condition has been discovered between the required 100 hour ROTAX inspection points. As such, the required inspection MUST not be counted on, a critical situation may develop between the inspection points!! \nStatistics dictate this is indeed a major problem. There are NOT that many RV-12s flying! \nIMHO, notification to all is much more important rather than trying to find a solution and issuing the notification concurrently with the solution. 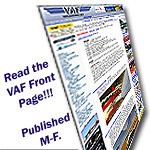 We can try to notify all via this website, but, Van\'s has the complete list of RV-12 owners. Gary asked me to post his photo\'s as he did not know how to do it. So, here are the photos of Gary\'s modification to the top shroud. A very eloquent change that allows access to the top left capscrew. \r\nWhat tool/technique did you use to make that nice neat cutout? \r\n	John Peck, CFII, A&P, EAA Tech Counselor, Flight Advisor. \r\n“Master Pilot” Award, UFO Member. \r\nRV-12 N37JP 120176 Flying since 2012. \r\nOne Week Wonder Build Team, OSH 2018. From the guys that have the problem, any sugestions for those who have not got to this stage? What would you have done during construction had you known the problem? Add Loctite BLUE generously to the 4 bolts. Made a removable cap for that corner of the air duct. That is about it. So far, there are a several unproven (and unofficial) ideas. Nothing is for sure yet, but the body of knowledge is increasing rapidly. Unfortunately you cannot do anything during construction or you are signing a fraudulent compliance statement at the end. So far, Van\'s has authorized changing the shroud which will be repeated soon in a revision to that page in your construction manual. These changes you read about are legal because they are made AFTER the fly-off period. With this aircraft, everything must be done as directed BEFORE the aircraft is completed. I would be very careful about making changes beforehand...you could end up with a large yard ornament. 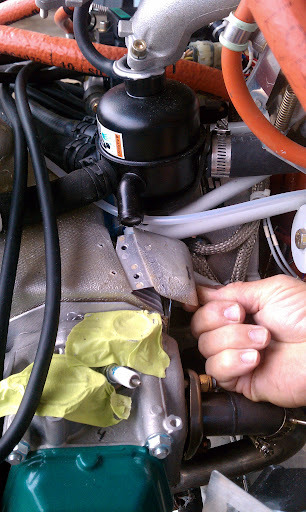 I think the best solution for this problem would be to use the same kind of lock washers under the engine mount cap screws as we use under the prop attach bolts. Lets see what Van\'s comes up with. I tightened the bolts at 25 hours and at nearly 100 hours I had 3 bolts loose. \nYes, I torqued them and i checked them at the 25 hour oil change, but not the inaccessible one. I erroneously assumed if it was covered up, it meant that access was not required therefore it would stay tight. \n2:moto- tool a slot that you can get a balldriver into to get to the left top screw. Then fiberglass a trough in so you can still get to the screw without leaking air. \nIf you wait till you get your engine in about the best you can do is rtv an aluminum cover. \nI theorise that the tough steel of the engine mount might be as hard as the lockwashers and they don\'t get a good bite. Van\'s is so far against the blue medium strength locktite, but the technician at LEAF said it would work good and he recomended it. Without locktite, you need a short inspection interval. \nI am not negative about this. With 400 RV-12s flying soon, we will be the largest fleet of new small airplanes, and any safety issues will be communicated on VAF. John I think your right about the lock washers not performing. I noticed that the engine mounting bracket arm was flexing slightly when I was aligning the bolts. Although they firmed up when I tightened the bolts to the engine it would seem that they shouldn\'t rely solely on the engine case for rigidity. This is a high speed, high compression engine. 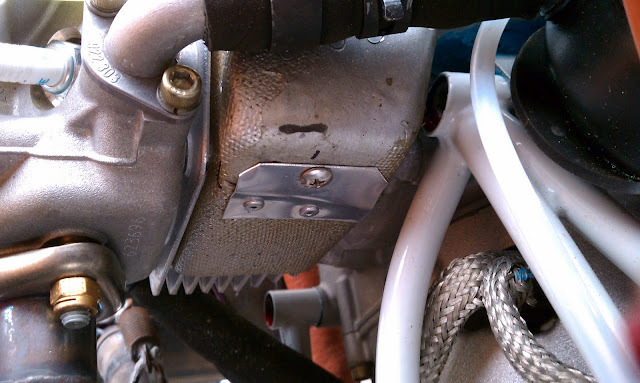 It seems to me that a significant amount of energy retention would be concentrating where the brackets clamp to the engine. I\'m probably over-analyzing. Hopefully Vans engineers will get back to us soon. In the meantime I will continue to inspect the bolts and enjoy the plane. \r\nI sent all of this to Van\'s, last week. EXCELLENT Patch ! Good job ! I really like it ! I did not take as much time. If I ever have to go back in, that will be my choice. We\'ll that explains why I periodically lose one or more of the 4 nuts and bolts that hold the mesh cage mounted on my car trailer in place. 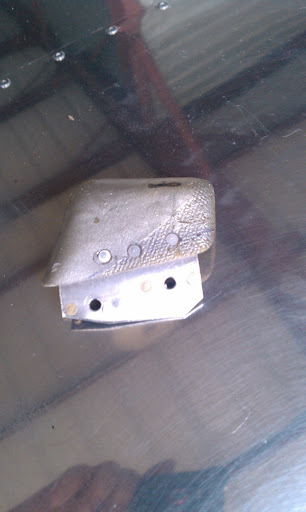 I used split washers, assuming they would stop the nuts from coming undone, but they don\'t. There is obviously enough flex and movement in the trailer and cage system while I\'m towing to occasionally work the nuts loose. \r\nI\'m still a long way from installing my engine, but the plans show that the ROTAX engine mount bolt assembly is basically no different to my trailer setup. \r\nI\'m surprised that VAN\'s apparently still haven\'t issued a warning to all affected RV-12 builders since the problem was identified last week, as it\'s clearly a serious safety concern. As far as I\'m concerned, it\'s not a question of blaming anyone. It\'s about preventing an accident. \nThis was also sent to Van\'s last week. Checked the bottom two bolts right after Larry called me (Thanks Larry) and found the bottom right tight. The bottom left needed about 1/8 turn. Was not able to check the top two bolts at that time because of the inaccesability. The top right looked OK but I really did not look very close at the top left. Just assumed that it was OK. Did a closer visual check today of the top left bolt. The bolt head is just about even with the outside edge of the engine mount. How loose it is (how many turns counter clockwise) I won\'t know until I can get in there but as a result I am grounded until I can get my 12 to a heated work area. This will take a while. A real bummer. Heard from Rotax Tech again today. He was not willing to commit on the blue Loctite, but I have read enough to feel firm on the 360 torque setting, blue Loctite, and torque seal with checks at each oil change. Until something better comes along, if it does that\'s where I am going. Certainly is curious. Bolts coming out right and left. Van\'s doesn\'t care, the Feds don\'t care (or don\'t read VAF...yah right). Those that Loctite swear by it, but neither the engine manufacturer nor the aircraft manufacturer...whom both recommend Loctite in much of the remaining assembly will not do so in this instance. What a bizarre situation! Of course no one did anything about the Zenith wings coming off until how many crashed? Am I missing a liablity issue here? Guess we\'ll find out when the first 12 smokes a hole in the dirt. \r\nThe silence from Vans is deafening. I made a locking device to prevent the bolts coming out. \r\n1/Purchase qty 4, 5mm bolts approx. 20mm long, Bolt heads should be same size as the hex in the socket headed engine mount bolts. \r\n2/ Fabricate from alloy bar, 4 pieces to the internal diameter of the steel engine mount tube that the engine mount bolts are recessed into and approx. 1/8 in longer than the distance from the head of the bolt to the outside edge of the steel engine mount tube. Thread the centre of the alloy bar plugs with a 5mm tap. Screw the 5mm bolts into the plugs using Locktite. 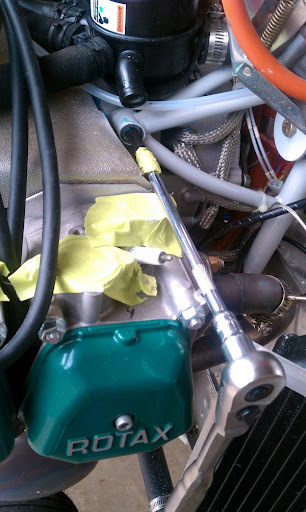 \r\nEnsure the engine mount bolts are Locktited and torqued into the engine. \r\nInstall the alloy plug into the engine mount tube ensuring that the 5mm bolt head is engaged into the hex of the engine mount cap bolt. \r\nUsing a 1/16in drill, drill a hole through the steel enine mount tube and the alloy plug approx. 1/8in from the outer end of the steel engine mount tube. Install a 1/16 S.S cotter pin through the hole and fold over the tails. \r\nThis should prevent the problems of the engine mount bolts coming out. \r\nWhat a terrific, creative solution to ensure a redundancy factor to this concern for all 12 builders/owners! You put your aircraft engineer experience to work! I\'m impressed and very grateful! Possible to get some pics either via this thread or by email? Thank you so very much! I did the 100 hour ROTAX maintenance check and am happy to report that each of 4 bolts had maintained the 30# torque. That\'s a very clever solution. Nice one! \r\nWhere can I find Torque Chart/Table for 912 ULS? \r\n I could not find any where. If you guys could give me the specific manual and page #. It would save my **** load of time. I searched this thread... trying to find metric allen wrench size to fit the engine mounting cap screws so I can have correct tool at hand when I next remove cowling. \r\nDoes anyone know metric allen wrench size? \r\nI\'m thinking 3/8" socket extension will allow me to torque bolts once I cut access hole in fiberglass cooling shroud. Am I making correct assumption here? \r\nI purchased a set of inexpensive metric 3/8" drive hex sockets from Harbor Freight. The set had the correct size for the engine mounting hardware ... which, if memory serves me correctly, was 6 mm (but don\'t hold me to that). \r\nI also purchased the extended ball tip version when they were on sale for around $9. I seem to recall they were 8mm... but I wouldn\'t swear to it in court. I used a 3/8 drive like the Harbor Freight link above, with an extension and torque wrench. Found upper left and lower left bolts finger tight. I removed all bolts and reinstalled with locktite blue. Cut a section of the cowl out to access the upper left. Reinstalled the cut out with nut plates and aluminum tabs for future inspections. I don't fully trust it yet. If anybody is interested, I will be glad to send photos via email.